Many questions (with solution) involving kinematics in one dimension and two dimensions have been posted on this site earlier. You may click on the label ‘kinematics’ below this post to access them. After obtaining the first result, you will have to click on the ‘older posts’ tab to access all the posts in this section. Alternatively you may try a search for ‘kinematics’ using the search box provided on this page. (1) A car travels from station A and to station B separated by a distance of d km. The average speeds of the car while covering the first and second halves of the distance are v1 and v2 respectively. What is the average speed of the car for the entire trip from station A to station B? The times taken for covering the first and second halves of the trip are d/2v1 and d/2v2 respectively. An object moving with varying speed has acceleration. But this does not mean that all accelerated objects must move with a varying speed. For instance, an object in uniform circular motion has constant speed, even though it has a centripetal acceleration. Its direction of motion changes continuously and it is the change in direction that makes it an accelerated object. For an object to be in accelerated motion, it is enough that its speed or direction of motion changes. Therefore, the correct option is (e). (3) A bullet is fired from a gun in a direction inclined at angle θ with respect to the horizontal ground. 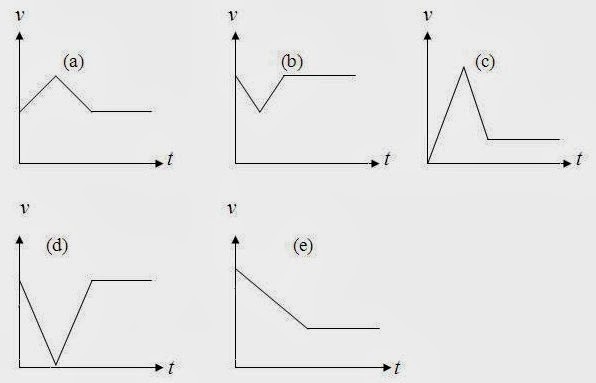 Which one among the following graphs represents the plot of the vertical velocity v of the bullet against time t between the instant of firing and the instant just before the bullet hits the ground? (Take the upward direction as positive). At the instant of firing, the bullet has the highest vertical velocity. When the bullet rises up, its vertical velocity goes on decreasing linearly (because of gravity) and at the highest point of its trajectory the vertical velocity becomes zero. The bullet then starts falling down with linearly increasing speed. In other words, the vertical velocity of the bullet becomes negative and its magnitude goes on increasing until it hits the ground. The vertical velocity of the bullet as a function of time is therefore correctly represented by graph (b). 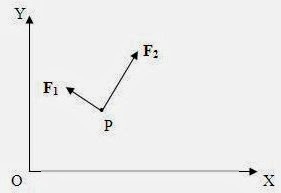 (4) The adjoining figure shows forces F1 and F2 with their lines of action in the XY plane and acting on a particle.P. and F2 = a2 î + b2 ĵ where î and ĵ are unit vectors in the x-direction and y-direction respectively, which one among the following statements is correct? (a) a1, b1, a2, and b2 are positive. (b) a1 and b1 are negative where as a2 and b2 are positive. (c) a1 is negative where as b1, a2, and b2 are positive. (d) a1, b1 and a2 are positive where as b2 is positive. (e) a1, b1, a2, and b2 are negative. Imagine the rectangular components of F1 and F2. You can easily see that the x-component of F1 is along the negative x-direction while the y-component is along the positive y-direction. The x-component of F2 is along the positive x-direction while the y-component is along the positive y-direction. This means that a1 is negative where as b1, a2, and b2 are positive [Option (c)]. (5) A small object at the foot of a smooth inclined plane AB (Fig.) is projected up along the inclined plane with an initial speed v. The object returns before reaching the top of the inclined plane and after reaching the foot of the plane, it moves further along a smooth horizontal surface AC. 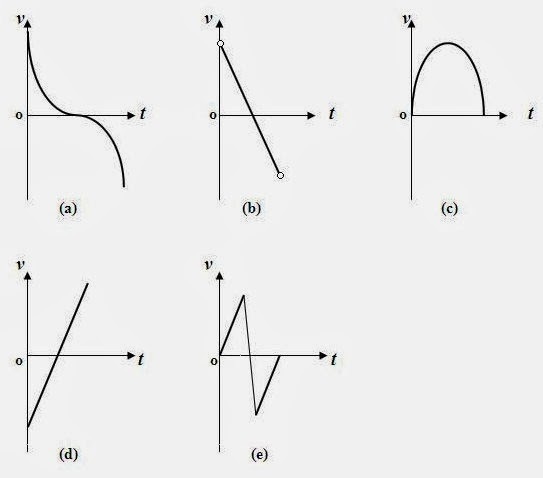 Which one among the following graphs represents the variation of the speed v of the object against time t? of the object therefore gets decreased uniformly and becomes zero when the object reaches its highest position on the incline. Then the object retraces its path with uniformly increasing speed until it reaches the foot of the incline. Then it moves along the horizontal surface AC with uniform speed. The above facts are correctly represented by the graph (d).